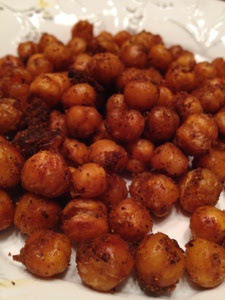 Toss the chickpeas in a bowl, add the oil and spices and mix until everything is coated. Taste and add more seasoning if necessary. Lay the chickpeas on a baking sheet. Bake for 45-60 minutes, giving them a stir every 10 minutes or so, until they are shrunken and crunchy. Allow them to cool. Then devour.